Happy Earth Day! 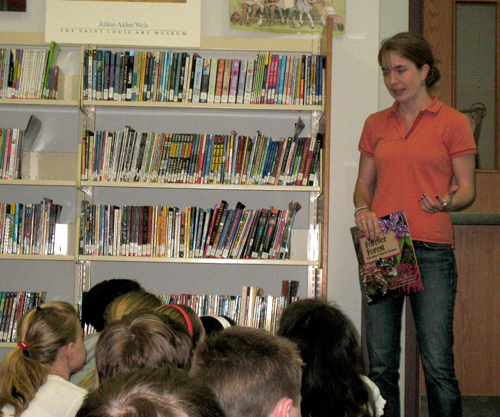 I visited Hagemann Elementary School in Mehlville, Missouri today, where I talked with the fourth and fifth graders in the library. 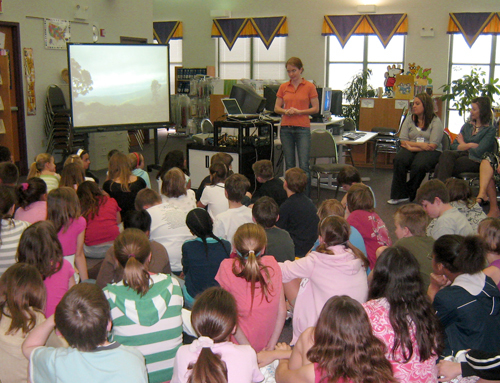 They were a great group, and asked lots of good questions about the writing and illustrating process. Some of the kids even took notes as I spoke. I could tell there were lots of prospective authors and artists in this bunch! I shared my new book, The Forever Forest, with them. This book tells the inspiring story of the Swedish second grade class who began a movement in 1987 to protect Costa Rican rainforests. Twenty years later, the Children’s Eternal Rainforest preserve in Monteverde, Costa Rica is now more than 54,000 acres – the largest private forest reserve in Central America. In the photo above, I am showing the students a picture I took of the Children’s Rainforest when I went there last year to do research for the new book. 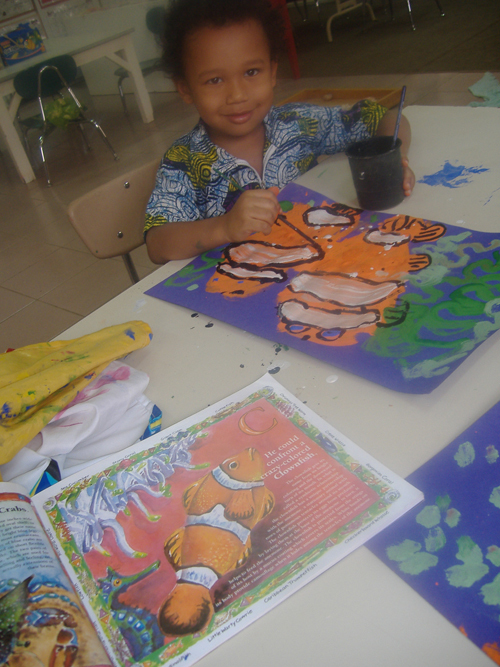 One of the teachers said she had actually visited the Children’s Rainforest herself. I wouldn’t be surprised if this sharp group of kids figured out their own way to help this special place. In the weeks before my visit, they started working on a pretty cool art project. 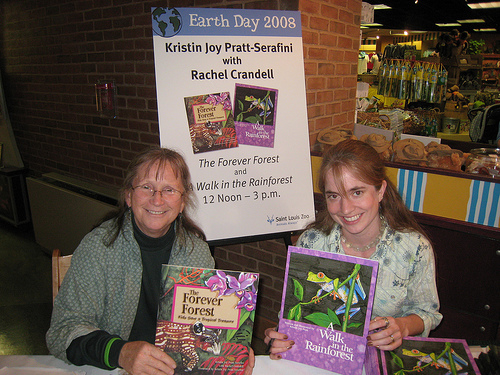 First, they read my two books Salamander Rain: A Lake & Pond Journal and Saguaro Moon: A Desert Journal. 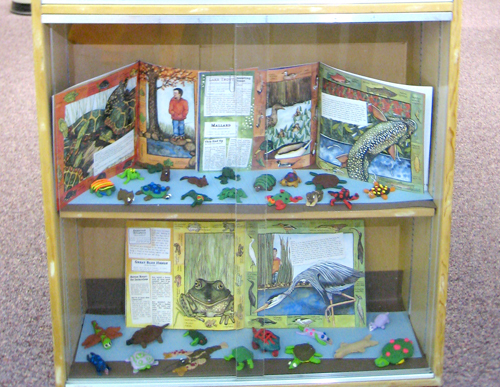 Next, they got busy making their own habitat dioramas with sculpted animals inside. 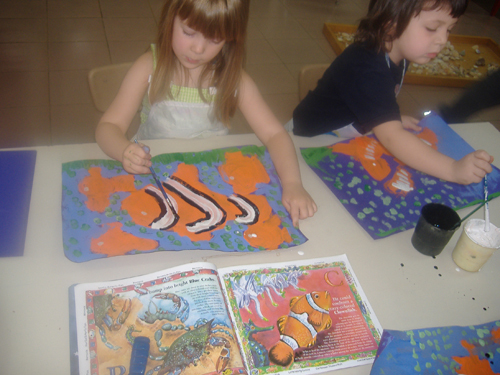 They were still working on painting the habitats, but in the picture below, you can see some of the animals they made. Thanks to Mary Ellen Kopsas for organizing this visit. Buenos dias! 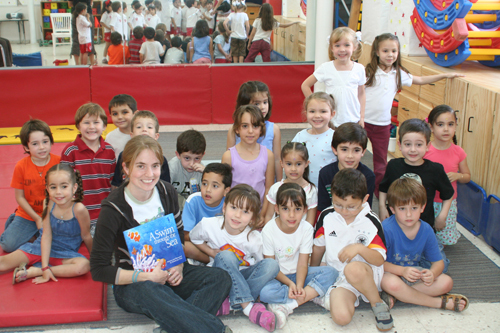 Just a couple of days ago, I returned from visiting the American School in Monterrey, Mexico. I took my husband Gabriel with me, and we had a fantastic time. We flew down from St. Louis, MO on Wednesday 09 April, and got caught in the massive American Airlines flight cancellation surprise. Fortunately, my dad is a pilot for Northwest Airlines, so he was kind enough to bail us out with some standby passes. Thanks dad! 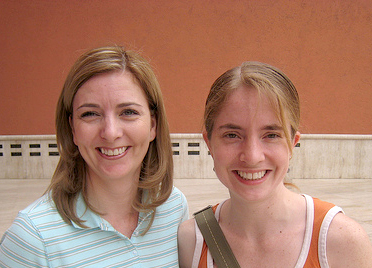 It took us a little longer, and we got to visit a few extra airports, but we arrived in Mexico on the morning of the next day. That left just enough time for me to still meet with all the kids. Yay! These are some of the kids. Aren’t they adorable? I spent two days at their school. 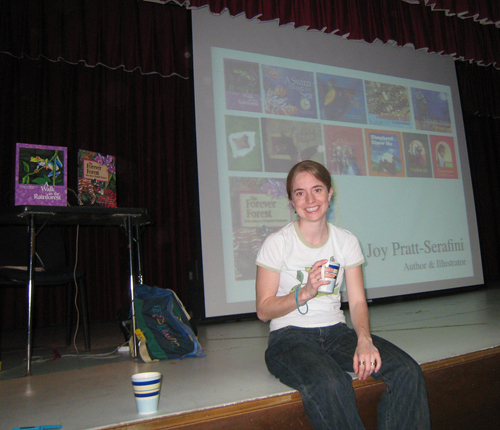 I gave presentations for K-5 in the auditorium, where I talked about my new book, The Forever Forest: Kids Save a Tropical Treasure, which is all about the Children’s Eternal Rainforest in Monteverde, Costa Rica. The teachers were all very friendly, and one even grabbed me a chai at the coffee shop across the street from the school. I was so grateful to actually have made it to the school that I forgot about how little sleep I had gotten in the process. 🙂 The friendly tech staff did a quick job of setting up my laptop as soon as I arrived, even though I don’t speak more than two dozen words in Spanish. This is my marvelous host, Ms. Fiona. 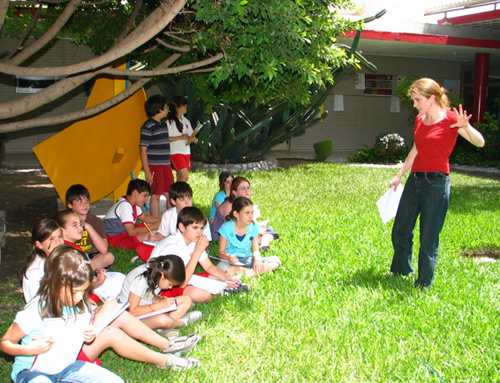 She is the librarian at ASFM (American School Foundation of Mexico). She, and her wonderful assistants, did all the organizing for this trip, and took great care of us while we were visiting Mexico. On Saturday, Fiona took Gabriel and me to see the Diego Rivera exhibit at the MARCO (the modern art museum). I loved it. We ended up seeing the whole museum, which also included an exhibit of other Mexican painters, and a whole floor upstairs for women artists. I wasn’t all that familiar with Mexican art, and had a great time soaking it all in. One of my favorite things I got to do with the students was a nature journaling workshop on Friday afternoon. Fiona had the third, fourth, and fifth grade teachers each select one or two students to participate, and I ended up with 24 kids in the library. First, I talked with them about what skills are needed to write and illustrate non-fiction books. What do scientists do? What do artists do? Then I asked the kids what qualities both artists and scientists need. Right away, one girl raised her hand and said “observation!” Well, that made it easy. Time to go outside and practice those observation skills. 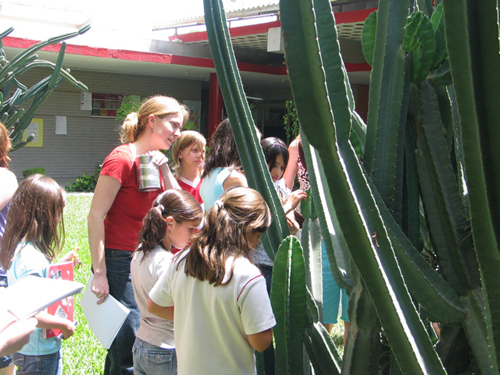 I took them out to a courtyard, where we observed a large, flowering cactus. First we looked closely at different parts of the plant. Then we sat down in the shade and wrote a list of five things we noticed about the cactus. Finally, we drew a far-away view of the cactus, and then a close-up of part of it. The kids really got into it. Several of them started asking questions and forming hypotheses about things such as why the flowers grow on the outside of the cactus, or why smaller plants grow in the shade of the cactus arms. This was my favorite part of the whole visit. Thanks, ASFM! 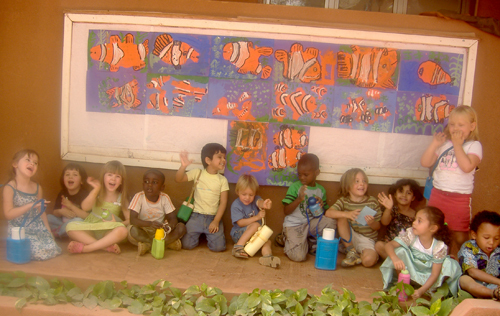 My Aunt Kim is the Elementary School Principal of the The International School of Ouagadougou in Burkina Faso, and she sent me this adorable picture of the Pre-K class, who read A Swim through the Sea in their classroom, and painted lots of happy clownfish for an art project. Adorable!